I sometimes feel I’m in the know, as far as, special needs and the iPad go, but I learned something new recently that is very cool! I discovered assistive technology is available to connect to iPads and help disabled and special needs folks read, write, talk, and see the iPad’s interface better. I was aware of assistive technology for computers, but just didn’t realize how much is now out there for the iPad, which is great for the special needs community. I’ll try and cover some for you to spread the word! In my post, iPad Gives Visually-Impaired Kids Insight, I discuss assistive technology for children who are visually impaired or blind. Pretorian Technologies, LTD created Simplyworks which includes wireless large key keyboards, mouse alternatives, switch interfaces, and communicators for the iPad. This, to me, is so cool because it extends the iPad’s use to people who might find even a laptop or computer difficult to adapt to with assistive technology. I am specifically thinking of special needs kids and teens. For visually-impaired friends, large keyboards help them type easier. They can see the large keys better and most keyboards are wireless and easy to connect to the iPad. Switch devices are used for users who are unable to touch the iPad screen. 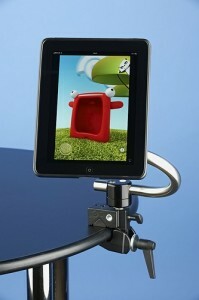 Inclusive TLC is a company that provides these as well as, SmartyPants app, and the iPad Amdi case. The case protects the iPad and includes a cover for the iPad button (to prevent the user from turning off an app), a sliding volume button, handles for carrying, and has it’s own connections, carrying handle, and desktop stand. Lower profile, muscle tone, use the switch talker. Ablenet provides assistive technology for iPads including desk mounts, switches, and mini speakers for users. Switches are buttons or devices for users who are immobile or have low muscle tone. They can be placed in a position where the user can easily access, like near the mouth or on a desk for special needs students. Switches can be easily changed for different students and their particular needs. Desk mounts are helpful for kids who need to easily view the screen (I honestly think everyone needs this to prevent neck strain). Other assistive technology devices are: RJ Cooper iPad Switches, Ablenet Blue2, Cicadia PageFlip, AirTurn BT-105, and Therapy Box Switchbox. The iPad has proven to be a useful tool for the special needs community. And now, even moreso, with devices like larger keyboards, large switch buttons, and other assistive technology to help special needs children and disabled users connect, communicate, and create.